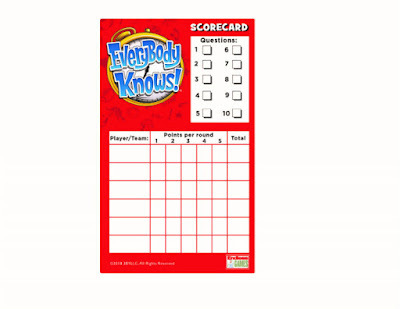 Are you a know-it-all? Think you can answer several questions in a short amount of time? Or would you crack under pressure? 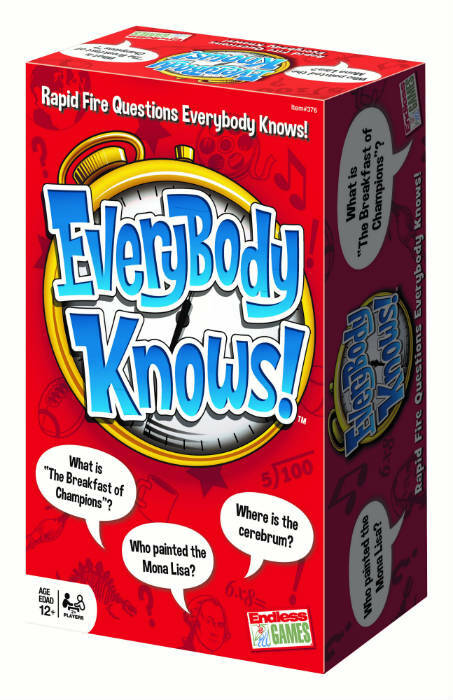 Everybody Knows is a game that will put you to the test. The child of your mother’s first cousin is who to you? Which sign of the zodiac is represented by a lion? How many arms does an octopus have? These are just a few of the trivia questions on the game cards. Some are rather easy and others take a tad bit more time to think about. To play the game, the first reader draws the top card and prepares to read the ten questions on the card. When ready, the sand timer is flipped and the first question is asked. If answered correctly, the reader goes on to the next question. 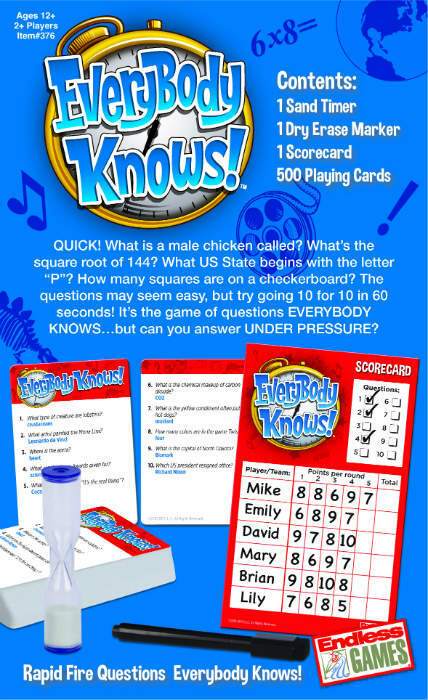 If an answer is incorrect, play moves on to the next question. The reader continues asking questions and recording correct answers with a check on the scorecard until the timer runs out. When that happens, record the points for that round in the pace on the scorecard. Play continues until every player has a chance to play five rounds (cards), and the team with the most points wins. Alternatively, the game can be played where the team has to answer ALL 10 questions correctly before time runs out. It's a little more challenging to play this way. This game requires you put on your thinking caps and use your "know-it-all" knowledge. We've played it as a family and it's super fun. 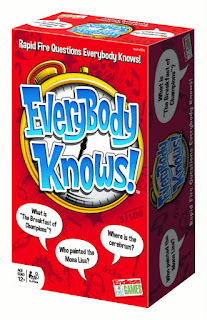 One person will win an Everybody Knows game. My family always enjoys playing card games most. I have always like Monopoly too. I like to play checkers. One of our favorite games to play is Sequence. We like to play Mexican Train. The kids like Monopoly. I like it too but get frustrated at the endless trading and haggling. We like to play Monopoly. Oh my... so many games. Monopoly, Battleship, Uno, Memory, Life. WE LOVE playing games with our kids. My family loves to play Uno. One of my favorite games to play is Monopoly. Thanks for the giveaway! My family loves to play uno!! I like Sorry as a board game. Word games are a favorite like Scrabble. We like playing a card game called Phase 10! I like to play Scrabble. I like to play Yahtzee. I like a lot of games. I'll go with Rummikub. I'm in the mood to play it. We love playing Phase 10 although we have been playing a lot of Bounce Off recently and loving it. The Game Of Life is one of my favorite games to play. Sorry! is one of my favorite games to play. Scrabble, Boggle, and Upwords are my favorites. But I also like things like Trivial Pursuit and Triomino's. I love to play Battleship with my grandson. I like to play Monopoly. I like Uno, Sorry, Clue or Monopoly. Flyergal82 (at /yahoo -dot !com? My family likes the game Pente. One of my favorites to play is Yahtzee. We like the game scattergories. I love playing Monopoly with my kids. We play uno a lot. Monopoly is one of my favorite games to play ever since I was a kid. I like silly games like Apples to Apples. My favorite game to play is Yahtzee! I always loved playing Trivial Pursuit and Clue. This game looks like a fun game that my family would enjoy. One of our favorite games to play is Scrabble. I like to play the game Sorry! My favorite game to play with the family is Clue. I have always loved Scrabble! We have game night every Sunday and play lots of different games. Some of our favorites are the Wikipedia game, Cover Your Assets, Phase 10, and Quiddler. I love to play canasta and backgammon. We like to play Bingo. I like to play Yahtzee with my family! I like to play Risk! My daughter loves playing monopoly! I still like to play LIFE, it's been my favorite since I was a kid. My favorite game to play is uno. My favorite game to play is the original Scrabble.